Time for some quick-fire questions for all you squash lovers. (1) What links Bill Paterson, Richard Dreyfuss and James Willstrop? No? OK, here’s an easier one. (2) What links Colin Firth, Tom Hiddlestone and James Willstrop? (3) What links Laurence Olivier, James Norton and James Willstrop? Well, yes, I suppose that most of you spotted that recently-crowned Commonwealth Men’s Singles Squash Champion James Willstrop is mentioned in all three questions. But, then, that wasn’t the question was it? In short, professional squash player James Willstrop is also a dramatic actor. Premiered in 1991, the play is a three-hander set in an unnamed South American country in which a new, democratic age is dawning. Housewife Paulina Escobar’s husband, Gerardo (James Willstrop), brings home a charming stranger he has found stranded on the road. Paulina (played by Clare Evans-Argent) becomes convinced that the stranger, Dr.Miranda, was part of the old regime and that he tortured and raped her for weeks while she was blindfolded. She takes Miranda captive to determine the truth despite attempts by both her husband and Miranda to convince her that Miranda is innocent. Ariel Dorfman’s explosively provocative, award-winning play was written in the wake of the Pinochet regime in Chile and continues to resonate with modern audiences as a stark reminder of the human rights violations we continue to witness in the world today. 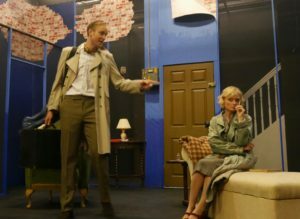 James Willstrop’s dramatic role in “Death and The Maiden” follows his well-received 2017 performance in ”The Deep Blue Sea” at the Ilkley Playhouse. Described as “an extraordinary exploration of love, desire, delusion and despair,” the play takes place over the course of one day. First performed in 1952, it begins with the discovery of Hester Collyer (Louise Button) in her flat by her neighbours after she has failed in an attempt to commit suicide by gassing herself. In flashback, some time before, Hester left her husband, Sir William Collyer, a respectable High Court judge, for a semi-alcoholic former RAF pilot, Freddie Page (James Willstrop). Hester’s relationship with Page was physical and passionate, but his ardour eventually cooled, leaving her emotionally stranded and desperate. The part of Freddie was “played with great languid nonchalance by James Willstrop” reported the Ilkley News in 2017. Last, but not least, Willstrop’s role in “The Deep Blue Sea” was preceded, in 2015, by a performance for which he received a best actor award at the Wharfedale Festival of Theatre. 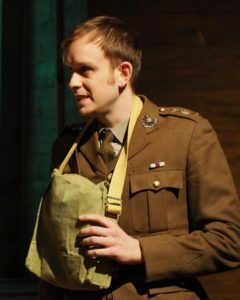 His role as Stanhope in the Adel Players production of “Journey’s End” was “particularly demanding as it required him to be on stage for almost all of the play” said one review. First performed in 1928 at the Apollo Theatre in London the role of Stanhope was played by the young Laurence Olivier. Set in the trenches near Saint-Quentin, Aisne, in 1918 towards the end of the First World War, “Journey’s End” gives a glimpse into the experiences of the officers of a British Army infantry company in World War I. The entire story plays out in the officers’ dugout over four days from 18 March 1918 to 21 March 1918, during the run-up to the real-life events of Operation Michael, a major German military offensive during the First World War that began the Spring Offensive on 21 March 1918. Thanks to Wikipedia, PSA World Tour, Harrogate Advertiser, Keighley News, The Adel Players and The Huffington Post. This entry was posted in Squash and Culture, Squash and the Arts, Squash Lives, Squash Players and tagged squash players by Peter Heywood. Bookmark the permalink.